We All Want to Lose Weight and Look Great! That is why I have compiled several years worth of weight loss information to come up with the Skinny Mini Workout program. There are so many diets and workouts out there right now that promise "super model" results with little to no effort at all, which if you've ever worked out to lose weight, you know just aren't realistic! I wanted to talk about something sensible, real, and above all else - DOABLE for those of us who just want to lose weight and feel great! No matter what people promise you, the only real way to lose weight is through a healthy diet and a good workout routine. In this article I'm going to go over some of my favorite information on how to get your metabolism fired up by using cardio and strength training workouts and how important they are to a successful healthy wellness program. It is very important to mix cardio with strength training using weights if you want to lose weight! Together these two deliver a knock out punch against weight gain and fat... but you have to do BOTH! The best cardio exercise out there is still the good old fashioned one - Walking! If you haven't been exercising, don't fret it - it's never too late to start. Just remember to start slow and small because if you don't, chances are that you will not stick with it. We've all been there on that day when we wake up and decided we are going to make ourselves into a Goddess overnight, so we go all out and either hurt ourselves or wake up the next couple of mornings not being able to even stand up. That does more damage to your body than if you never start a program at all, so go slow. Make sure you are doing it right, remember you need to be walking fast enough to get your heart rate up or your not burning fat. Start out with a daily 30 minute walk alternating your speed from brisk with bursts of fast paced walking mixed in. Remember to stay hydrated - drink at least 16 oz of water a couple of hours prior to your workout, and then about 8 oz when done to avoid muscle cramps. Eventually the 30 minute walks will become too easy for you to be doing any good (roughly in about 1-2 weeks depending on fitness level). That's when it's bump up time - increase the workout to 45 minutes and increase your overall speed and that of your phases. Need more of a workout - try carrying dumbells or get some leg weights and do your walks with those on. Strength training is to be done on an "every other day" basis - this will give your muscles time to recuperate and that is when you actually build new muscle mass. One of the most common errors women have is using weights that are too light for them. If you don't use enough weights your not going to get your metabolic boost that you want. The best way to choose the right weight for your body is to give the weights a try. Ideally the weight should be heavy enough that by your last rep you feel that you couldn't do any more. Since there are different muscle masses in your body, you will probably need different weights for different exercises. I suggest getting a set that has removable dumb bells to adjust the weight to the appropriate level needed. Remember, you didn't get out of shape over night and you're not going to get up off the couch and immediately run a 5k or be back into shape over night either... As with any workout program or exercise routine, it takes time. Be patient with yourself and don't give up - even if you slip up or miss a day. Just jump back into it as soon as possible, You'll see the results! My favorite saying is this: If you always do what you've always done, then you'll always get what you've always gotten! 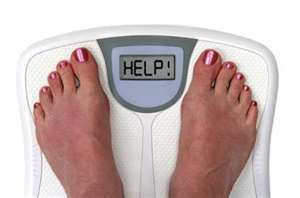 Also, you can check out another of my articles on weight loss How To Lose Weight for Women Over 40.